This musical takes place in May. Students from 2nd and 4th Years from Blackrock and Loreto Dalkey take part in the show. Tickets: Students €10 | Adults €15. Available Now! From the makers of ‘The Parent- Teacher Meeting’ and ‘Parklife,’ Blackrock College and Loreto Abbey Dalkey are proud to present their latest musical sensation- ‘FAKE NEWS’. The show begins next Tuesday until Friday night (9th – 12th May). It’s a hilarious rip-roaring comedy that combines current affairs with great 80s tunes. Sure to be a sell-out, this year’s musical is not to be missed! Ticket sales have been a huge success so far. There are still some tickets available on the door for all of the nights. If you wish to guarantee yourself a seat, you can email Ms Keenan at nkeenan@blackrockcollege.com to reserve tickets. Tickets can be purchased at reception or from TY students selling throughout the school. Doors open at 7 pm for a 7.30pm kickoff. Enjoy the show! FAKE NEWS- MAKING MUSICALS GREAT AGAIN! This is a Transition Year project that takes place in May. It consists of week-long workshops in disciplines such as song-writing, samba drumming, guitar, architecture, photography, rap, urban art, hip-hop, DJ skills, drawing, creative writing etc. 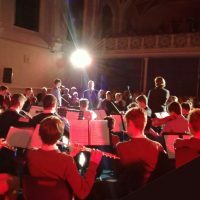 This takes place on the Thursday of MAD week and includes performances by the Orchestra, Libermann Choir, Parents’ Choir, Boarders’ Choirs and Soloists. This term, as part of the first ‘cross-class youth development programme’ to be established in Dublin, seven transition year students performed in the Five Lamps Arts Festival, as part of the Blackrock Swan Music Programme. This weekly programme sees the seven TY students, along with their inner city counterparts, explore issues of class and its effects on young people growing up in Ireland today, through the medium of music and songwriting. Singing and playing from a barge on the canal, the various cross-class bands performed songs throughout the evening of April 1st, creating a wonderful atmosphere on Charleville Mall which had been closed to traffic and turned into an inner city street festival for the occasion. They also recently performed their original songs at the Irish Youth Music Awards on 22nd April in Croke Park where they won the award for most collaborative approach to the event. This ground breaking social initiative has proved a hugely positive experience for all involved, due in no small part to the commitment and dedication shown by Peter Coyle, Tom Dwan, Tadhg Egan, Gavin Jones, Rob Jordan, Thomas McCormack and Ruairi Moore of transition year, as well as all of the participating young people of Swan Youth Service. 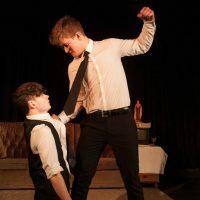 Tear Up the Ground, a new play written and directed by Mr Maher and Mr Cleary and starring Roy Geary (6th Year), Cian Hassan, Harry Kearns, Hugh Kelly and Louis Keyes (5th Year), won Best Play at the St. Andrew’s One Act Drama Festival in February this year. It was also awarded Best Actor, Best Supporting Actor and the Adjudicator’s Award for Best Writing, Execution and Overall Production. 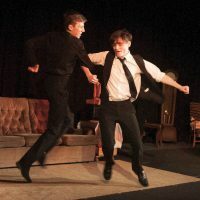 This phenomenal achievement was followed up by a ‘homecoming tour’ of the show in the college, seeing the Creative Arts and Digital Learning Centre transformed into an intimate and atmospheric theatre space. Here, the accomplished cast played to two full houses, each night receiving a standing ovation in recognition of the remarkable standard of ensemble acting and professional performance achieved. Special thanks to Stephen Ryan (5th Year), Sean Hannon (4th Year) and Mark Landers (3rd Year) who ensured the production went off without a hitch each night and to Lorraine Hoffman and Gavin Coll, without whom the production would not have been the same. 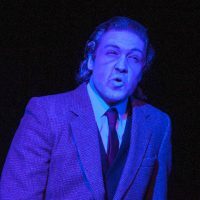 Through carefully balanced humour and tragedy, the cast explored the dynamics of family life and the intergenerational nature of the effect we can have on those closest to us. They constantly held the audience throughout the piece with a level of the emotional investment and nuanced performance far beyond their years, a reflection of the dedication and commitment they had shown to throughout the creative process. Congratulations to all involved in their realisation of this outstanding piece of original theatre. This show takes place over 4 nights in November and involves students from 4th, 5th, 6th Years as well as 5th Year students from Mount Anville. John Proctor has betrayed his wife. Abigail Williams wants him for herself. “The devil is loose in Salem” and “the whole town’s talking witchcraft”. Loyalties will be tested. Faith will be doubted. Morality will be examined. Authority will be challenged. Witches will be tried. And people will hang. Over the last four weeks, the cast of ‘The Crucible’ have taken on one of the biggest theatrical works of the 20th century and they’ve given it everything they’ve got. For four nights only the incredible true events surrounding the Salem witch trials of 1692 will be brought back to life in the Jubilee Hall this November. This is arguably Arthur Miller’s most accomplished work and puts the audience “squarely in front of themselves” to engage with the eternal struggle of what happens when good confronts evil, right opposes wrong and unfaltering common morality defies infallible religious authority. In a climate of manic social hysteria, who will accuse another to save themselves? Who will remain silent in the face of injustice? Who will stand up for what is right? And who will die for it? This annual concert takes place in January in the National Concert Hall. About 150 students are involved. 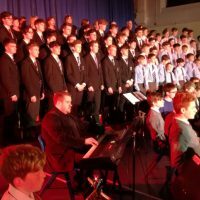 The programme includes 4 choirs, an orchestra, soloists, bands, vocal and instrumental groups. 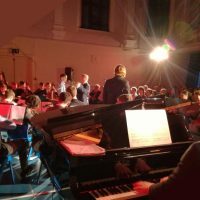 The concert showcases the musical talent within the school, both classical and contemporary.